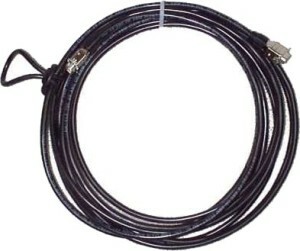 Remote Sensor Cable image shows strain relief which is included only on the 20 ft. cable. Black shielded DB9 cable connects the Sensor Housing to the Console (one 20 foot cable included with the Alta and the AltaCom II). Use singly or in series, with or without the J10 or J20 Connector Panels. Custom lengths in 10 ft. increments. For other lengths call (304) 497 2756 to order by phone. Cables are $15 per end and $3 per foot.